One of the most challenging activities for every business – even now in the age of marketing automation – is managing the handover of leads from marketing to sales. For some businesses, this comes down to a simple disconnect between marketing and sales activity – teams working independently in silos – for others, it comes down to not having the right tools to facilitate the process and streamline it. But with the tools that exist today, lead management shouldn’t be an issue and it shouldn’t be time-consuming or resource-intensive. 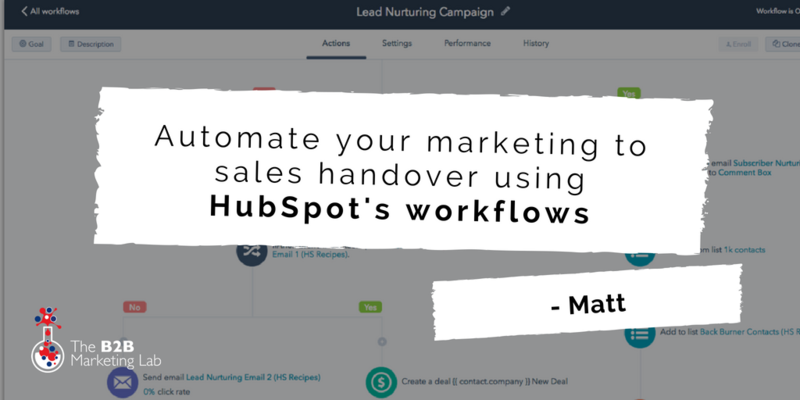 With tools like HubSpot, it’s entirely possible to automate the marketing to sales handover using workflows. Workflows, in the simplest of terms, are sequences of processes (of any kind) that illustrate how an action, activity, piece of work – you name it – goes from initiation to completion according to a set of procedural rules. More advanced workflows are built around a chain of conditional actions; if the conditions are met, you move on to the next action, and if they are not, you move on to another. HubSpot provides the means to built such advanced workflows; workflows that can include any number of conditions, triggers and variables to help you automate your marketing and sales activities, so imagine how easy it is to automate the handover of leads from marketing to sales? On a day-to-day basis, we build advanced workflows for our clients using HubSpot. The client explains to us their lead qualification and lead management process, as well as the lead individual stages involved, and we build out workflows to help their marketing team transition leads to marketing qualified leads (MQLs) to sales qualified leads (SQLs) based on specific actions. These leads are then assigned to the correct team for engagement and enrolled in another lead nurture workflow. Getting to this point is not at all difficult, but it does require an investment of time. The first step in any lead nurture workflow strategy, is setting up a workflow to automatically assign leads to the right lead owner (marketing or sales) based on their “original source” and how they converted. You might be wondering (even as a HubSpot user) what we mean by “original source”. Original source refers to the channel through which a contact first arrived on your website prior to becoming a lead. Channels include organic search, referrals, social media, email marketing, paid search, paid social, direct traffic, other campaigns and offline sources (such as events or meetings). When a visitor first arrives on your website, HubSpot tracks their activity with the HubSpot tracking code installed on your web pages. HubSpot identifies unique visitors by placing a tracking cookie on their browser long before they even convert to a lead through a form, and the moment they convert, HubSpot will associate their newly built contact record with any activity that was tracked previously (thanks, cookies). HubSpot analytics will attempt to match contacts with previous anonymous website visitors – and if there’s a match, the “original source” will be updated to reflect the source of your leads’ earliest visit to your website. Why is this important? Well, because some channels indicate a higher level of “sales readiness” than others. For example, people who arrive on your website via organic search and convert on a top-of-the-funnel eBook are most likely conducting research and exploring options, so they should be sent to marketing for further nurturing. People who arrive on your website via paid search and convert on a bottom-of-the-funnel content offer and view your pricing page, on the other hand, are more “sales ready” and should be assigned to the sales team for nurturing and follow-up. What if a contact converts by filling in a contact us form? They’re a hot lead and should be sent immediately to your sales team for follow-up. All of this is manageable through HubSpot. You set up a simple workflow to assign leads to specific teams based on their original source and how they converted on your website. This approach allows you to make sure no leads fall through the gaps, that leads are always engaged with by the right team, and that the correct lifecycle stage (subscriber, lead, MQL, SQL, opportunity, customer, evangelist) is set from the beginning. But once you generate these leads and assign them to your marketing or sales team, how do you keep them engaged? Generating leads is just the start – the next part of the process is nurturing them until they become either MQLs or SQLs (and are actually ready to engage with your business) and content plays a key part in this process. We, as marketers and salespeople, operate in a world where B2B purchase decisions increasingly start with a Google search. Your prospects are self-educating; they are scouring the Internet for valuable content – blogs, eBooks, whitepapers, case studies, video – that helps them to understand and solve their business problem. On that basis, any leads you generate (and you’ll probably generate most of them through content) must be further nurtured with high-quality content. Blogs, eBooks, whitepapers, case studies, infographics, video, webinars, product demonstrations, pricing documents – all of these content assets allow your leads to engage with your business on a level other than “contact us”, and all help you to move leads through your sales funnel. Instead, automate the process. Use workflows. You can set up different workflows to send different content and when combined with a lead’s original source, you can quickly deduce the type of workflow(s) a lead should be enrolled in. For instance: a lead first arrives on your website via organic search and converts on a top-of-the-funnel content offer. This tells you that they are conducting research and most likely at the beginning stages of the buyer’s journey. So to nurture this lead, you set up a workflow which triggers based on their “original source” and the content they converted on. Included in the workflow is a series of weekly emails (over a period of a month and with a week’s delay), all of which promote another content offer relevant to the first content offer the lead downloaded. For example, maybe they originally downloaded a top-of-the-funnel eBook on Growth-Driven Design (GDD), so the next email contains another top-of-the-funnel content offer around Growth-Driven Design. The next email you send (a week later) includes a middle-of-the-funnel content offer around GDD, but this time it might be a case study on how your business has helped businesses like theirs with GDD. The next email you send, once again, a week later, includes another middle-of-the-funnel content offer around your GDD services, including various case studies and testimonials from clients to help illustrate your expertise and encourage the lead to engage with your business. The final email you send at the end of the month, includes a bottom-of-the-funnel content offer – perhaps a GDD consultation, pricing document, or a branded GDD website example for their business. This is an incredibly simple but effective workflow that will help you to naturally move your leads through the sales cycle with content and without being pushy, salesy or prompting your leads to unsubscribe from your emails. Once you have nurtured your leads to this point – you can set up the workflow to move leads to MQL based on the content they have interacted with – the next step is to transition them over to SQL so that your sales team can engage. First, you need to agree with your sales team on what actions and/or criteria designate a contact as “sales ready” (perhaps filling in a specific form for a bottom-of-the-funnel content offer on the website, requesting a consultation, or completing a lead nurture workflow) and then use workflows to automate the handover of MQLs to SQL. For example, a lead enrolled in your existing lead nurture workflow has downloaded all of the content you have provided them, becoming an MQL in the process, and the last email has direct them to a bottom-of-the-funnel content offer on a landing page (perhaps a consultation or demo) on your website. To move this lead from MQL to SQL, you can create a workflow which enrolls them based on the content assets they have downloaded thus far, and whether or not they have completed the lead nurture workflow we mentioned previously. If they meet those conditions and fill out the form on the current landing page, you can set the workflow to move them from MQL to SQL and tie that workflow to the current landing page. What happens is that the moment the lead completes the form on the landing page and the workflow identifies that they have a) downloaded all the content assets in your lead nurture workflow and b) completed the lead nurture workflow, they will be assigned the lifecycle stage of SQL and moved to a new lead owner on the sales team. By using workflows, you avoid all the manual labour involved with updating contacts in your CRM based on interactions with your website and allows both your marketing and sales team to focus on generating more business. Now that you know how to nurture and transition leads correctly, you need to set up workflows for your sales team to push SQLs further down the sales funnel and turn them into paying customers. The next thing you need to do is set up workflows to create tasks and assign them to your sales representatives. If an SQL registers their interest and your sales team sends out a contract, your sales team need to keep on top of that and be notified if there are any changes. To help with this, you could create a workflow that enrols SQLs with deals associated with them the moment a contract is sent. The workflow could then include a series of tasks for sales reps to carry out at regular intervals – such as keeping in touch/following up to ensure the contract gets signed. You don’t want your sales team to fall at the final hurdle – setting up workflows such as the one above will help them to keep tabs on sales opportunities and push them over the line for the business. Finally, set up workflows to keep in touch with your customers. Keeping in touch is a simple, but often overlooked task for marketers and salespeople alike. Many marketers and salespeople make the mistake of not “checking in”. They believe that after winning a customer’s business and making the sale, there’s nothing left to do or say. The art to successful sales engagement lies in not only treating your prospects well, but valuing your customers and maintaining a good relationship with them. Your customers are your best advocates, they are the ones that will shout from the mountains how great your business is and how you helped them to solve their problem. So, treat them well, keep in touch, send them relevant content and material that they might be interested in. You can set up a workflow to send out a personalised email (tailored by your sales reps) after a set duration if you want to keep in touch with your customers; think of it as a really nice follow-up email. The email can ask them how they are, how the business is going, and if they need any help. Similarly, your marketing team could send out marketing content that they might find helpful (based on their contact record and what content they have engaged with on your website previously) as a way of keeping them up-to-date and informed. With this approach, you not only tell your contacts that you are thinking about them, but also that you care. They may have been busy and forgotten about your business – it happens – but by setting up such a workflow you ensure that no extra business opportunities fall through the net. If you have done the hard work of generating the leads for your business and got them to a point where they are interested in your business, don’t sell yourself short by failing to streamline your lead handover and failing to provide your sales team with the necessary workflows to enhance lead nurture. If you have HubSpot, start building workflows now – you’ll be pleasantly surprised at how much time and resource they can save you. If you need help building more sophisticated workflows however – perhaps you have multiple websites and segmented lists of contacts that require different levels of engagement – we can help.